I have a confession. I’m rubbish at the original Pac-Man, and always have been. But it’s a damn addictive game. While most gamers and even non-gamers will have sampled the original at some point in its now 34 years of existence, all would surely agree that Pac Man is one of the most iconic and recognised video games (and characters) ever developed. So iconic in fact, that Pac-Man has undergone many evolutions over the years, from variations of the original formula to a side scrolling platformer. So, for no anniversary whatsoever, Bandai Namco has repackaged 9 (+ 1 DLC) of these classics for old and new generations to explore and enjoy. Starting with Pac-Man (1980), the original pellet-guzzler is timeless, but for those who have never sampled it, the premise is simple: Collect all the yellow dots whilst avoiding contact with the ghosts. 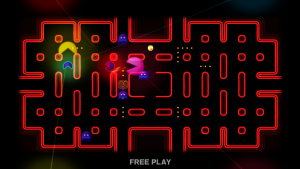 The 4 bigger pellets turn the tables, turning the ghosts blue, and becoming additional Pac-Man fodder for grabs. Classic arcade stuff and very challenging to boot, it’s inclusion in the museum is a given, although the fact it had been available through XBLA as a standalone title for 8 years surely means many will already have this in their catalogue. Pac-Mania (1987): Definitely one of the better titles in this compilation, Pac-Mania was the most refreshing take on the original to date; essentially the original with an isometric 3D viewpoint, but with the added ability for Pac-Man to jump. To keep that from destroying the difficulty curve altogether is the more close-up view of the area, meaning searching for those last pellets can prove elusive. Pac-Man Arrangement (1996) is a decent stab again at the core Pac-Man ‘genre’, but with a fake 3D stage view, and a horrendous colour palette. All is forgiven with its revisit to the core gameplay that reminds you of the original for the right reasons. Pac-Man Championship Edition (1997) is not a Pac-Man Street Fighter game, despite the title, but is by far and away the best Pac-Man game in this compilation. 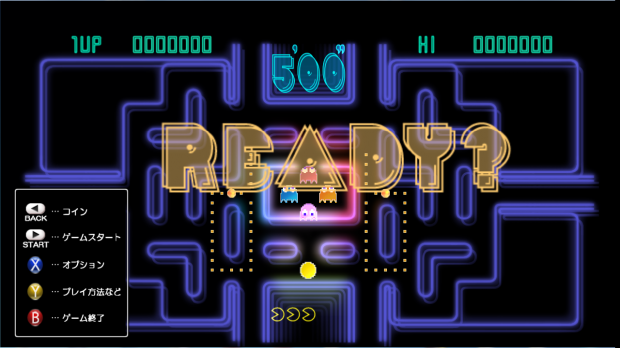 Pac-Man core values with score-attack principles set upon neon-lit but familiar stages makes for fantastically addictive fun, and delivers that true ‘one more go’ factor. The problem is, XBLA already has a superior ‘DX’ version since 2010 that most Pac-fans, like me, already own. Pac-Man Battle-Royale (2011) is arguably the most original Pac-title, and one of the most fun. The ghosts are just a side-obstacle here as you put yourself in the typical mazes against…. other Pac-Men! The super pellets increase your size and speed to try and eat your opponent, or otherwise push them into the ever-present ghosts. It’s a bore on your own, but with online-only multiplayer (wut? ), I don’t think I’ve had as much simple multiplayer fun as the original Bomberman. Super Pac-Man (1982) and Pac & Pal (1983) are close to the original, but the goal is to collect keys and unlock gates as opposed to eating pellets. 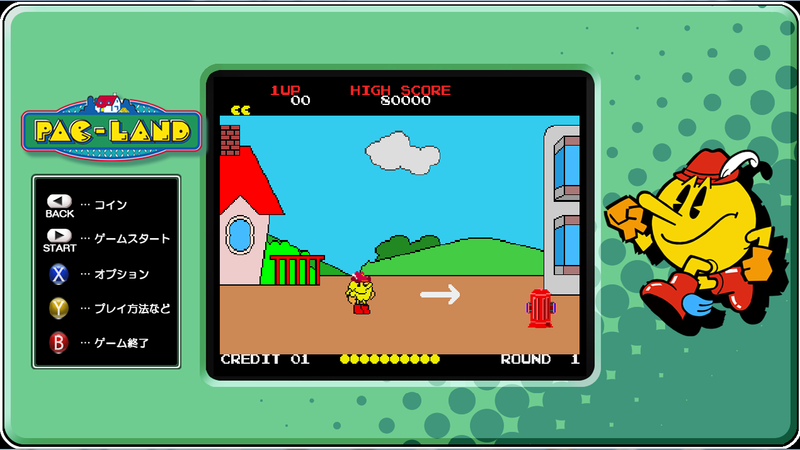 The ‘pal’ in Pac & Pal is Miru, who helps you collect the required items on each level in order to progress. 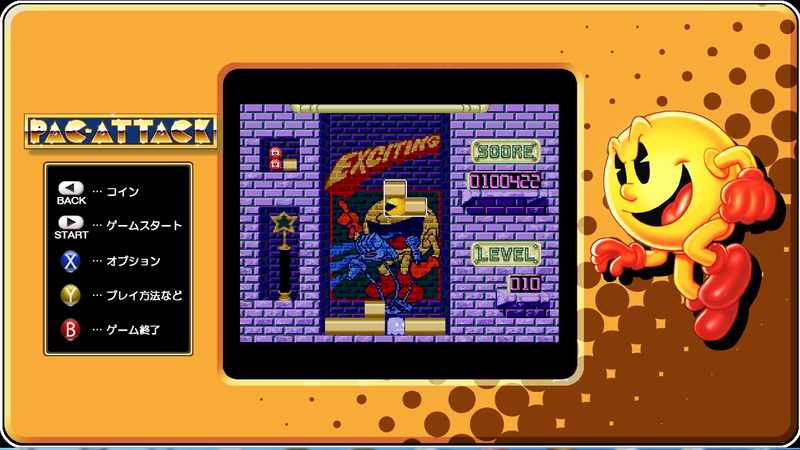 However this introduction only serves to make the Pac-Man experience more confusing and even less fun. Plus having to keep an eye on an A.I. Miru and yourself becomes tiresome very quickly. Pac-Land (1984): The Pac-Land main theme is one that is embedded in my brain from visiting arcades all through my childhood and teenage years. This side-scrolling platformer was a major new venture for Namco’s titular character, and was certainly my most anticipated title to play from the museum. But from just completing the first stage, my childhood memories were shattered, only to reveal a platformer so devoid of any fun, meaning, with ridiculously unfair physics that make any Mega Man game seem like a walk in the park. Pac-Attack (1993): This horrific Tetris/Dr. Mario rip-off is just very, very dull, which a steep learning-curve from the get go that will put most off after a few minutes. The ‘Museum’ is a pretty standard affair, allowing you to choose from the games on offer, the list of achievements, etc. Each museum title can earn you up to 8 stamps for achieving the required goal(s), which range from the simple (beat the first level) to the obscene (score 300,000 in Pac-Man). Other than that, I feel a massive opportunity has been missed; if this is indeed a museum, where are the history details? Instead, all there is in addition to the menus and the games is a rather bizarre first person view into a room where unlocked characters (via stamps) can be viewed in some kind of holding cell. Very bizarre. So, as compilations go, Pac-Man Museum is pretty good, but is a release that, bar Battle-Royale, would have been more relevant 5 years ago. The fact that most fans will most likely already have the original and the Championship Edition DX games through the same service for some time will find the £16 price tag a total turn off. Make no mistake though; there is a lot to enjoy here, whether you have done before or not.